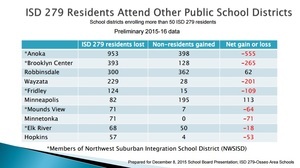 As part of an annual process, the District 279 School Board heard about current enrollment trends and enrollment projections at their Dec. 8 meeting during a presentation from Executive Director of Finance and Operations Patricia Magnuson. The projections are important for budget and staffing decisions, according to Magnuson. Enrollment for this fiscal year more than last fiscal year by about 89 students, she stated. 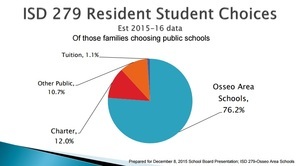 During her presentation to the School Board, Magnuson reviewed estimated enrollment trends for the 2015-2016 school year – including options by families living in the Osseo Area Schools area to attend other school options outside of the district. A further breakdown was provided of which public school choices by families, such as neighboring school districts and charter schools. Looking at early projections for the 2015-2016 school year, Magnuson told the school board the student population is up from last year. A slide of "draft enrollment projections" estimated enrollment for the 2015-2016 school year is 20,099 kindergarten through 12th grade students - with the most students in ninth grade (1,664), second grade (1,627), and 11th grade (1,603). “That is big news. Early projections for next fall show increased enrollment,” she said. Projections for the 2016-2017 school year estimate enrollment for kindergarten through 12th grade to be approximately 20,105 students with the most students in 12th grade (1,724), 10th grade (1,716), and third grade (1,600). The next steps, according to Magnuson, include finalizing grade level enrollment projections and preparing enrollment projections for budgets, staffing, and facility planning. Video of the presentation at the school board meeting is below (starting at the approximately 1:05 mark). 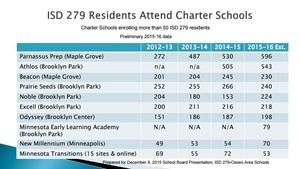 Editor's note: What do you think about the enrollment projections for the Osseo School District 279? Share your thoughts in comments below.